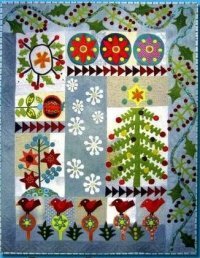 This Christmas quilt is so cute and fun. It reflects the "merry and bright" of the holiday season. Crimson Tweed, by Sue Spargo, is a wool on cotton applique quilt and finishes 39"x51." Crimson Tweed is a nine month block of the month program at $29.99 a month. The book and floss are sold separately. This would make a great present for the appliquer and wool lover in your life! Get yours today! There are still three spots available for next weekend's quilt retreat hosted by HIQ at the Greenbriar Retreat Center. The retreat is Friday, Dec. 13, through half-day Sunday, Dec. 15, with the option of arriving on Thursday, Dec. 12, for an additional $100. This is a great get-away from the holiday hustle and bustle and a way to get your Christmas projects completed. Sign up now. 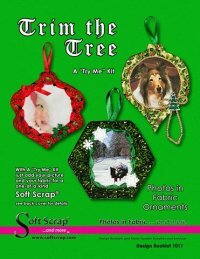 Join us for a photo ornament workshop with the experts from Soft Scrap! Fun for ages 8 and up! Great class for mother and daughter! Fun way to preserve Christmas card photos! Use your photo to create a one of a kind Christmas Ornament with the Soft Scrap technique. In class we explore the basics of printing on fabric with special tips and techniques to help you get the most out of your photos. It's a simple hands-on project that also uses simple embellishment techniques such as ribbon work and ruching, along with lots of other embellishment ideas. What a fun project to hang on your tree, or what a great gift idea. This fun workshop will be offered on Saturday, Dec. 14, or Monday, Dec. 16, from 10 a.m. - 1 p.m. Class kit is required and will be provided at the beginning of each class. No need to bring sewing machines to class. Enroll here. We will be closing at 5 p.m. this evening due to the deteriorating weather forecast. Please watch Facebook and your Happy Grams for updates on whether or not the shop will be open on Friday and/or Saturday. If McKinney ISD is closed, we'll be closed. Whoa, it has been busy here at HIQ. We are so thankful to have amazing customers who support our shop! Quiltapalooza and our Anniversary Sale-abration were a major success thanks to you. We really believe happiness is quilting and it really pleases us when our customers are joyful and excited about their quilt projects. With the holiday season under way, we want to give you a heads up on our Customer Appreciation Luncheon. Get your pens out, smartphones or tablets and mark your calendars for Friday, Dec. 27, from 12 p.m. - 2 p.m. You can RSVP here. Join us for our instructor open house and meet our talented and award-winning instruction team on Saturday, Dec. 6, from 10 a.m. - 12 p.m. See what we have in store for you in 2014 and get energized for a new year of creativity. Please check your Happy Gram and Facebook before coming down for the Open House due the forecast of inclement weather. Using one of the Quilted Crow Girl Designs Weekender patterns, we will show you how to applique on wool with cotton thread the way our friends Down Under applique their gorgeous quilts. Here's a hint ... you'll learn a smaller stitch and use staples. The Wool Starter Kit is perfect for this class. Register today.